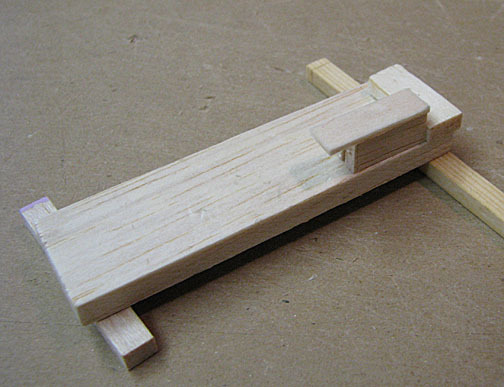 Three Klett hinges were used on each side of the horizontal tail. 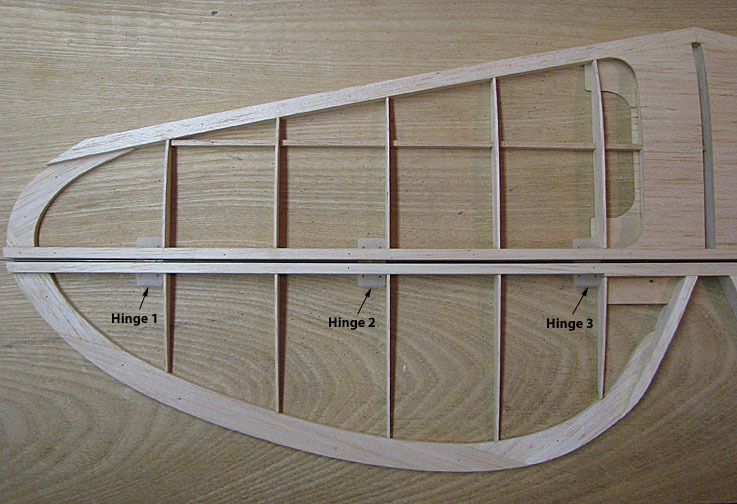 The maximum thickness of the stab rear spar at the hinge line is 5/8". So the hinge halves were installed 5/16" up from the bottom of the rear spar as shown below. This picture is a view of the stab's rear spar showing all six hinge halves installed with a single .032" piano wire hinge pin running through all six halves. The picture below of the left half of the horizontal tail shows the stab and elevator pinned together with three hinges. 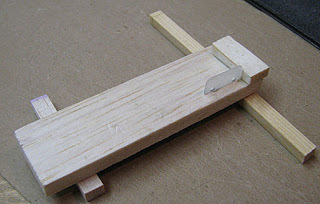 The significance of this picture is how far the hinge tongues extend out beyond the 1/4" thick spars. Twelve enclosures (little boxes) for these twelve hinge tongues were made in an assembly line fashion using a simple jig as will be described below. The 5/16"X 11/16" sides of the enclosures were cut out of 1/8" balsa as shown below. 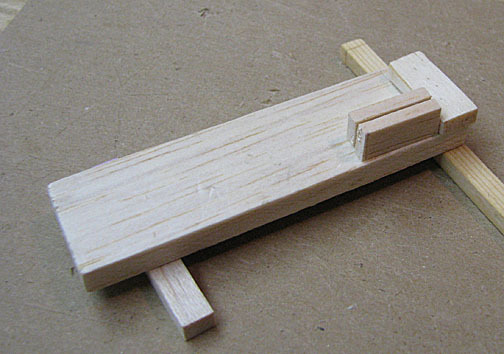 Two of the 1/8" enclosure sides were placed on either side of the hinge tongue and butted up against the jig's stop as shown below. A piece of 1/16" balsa was glued with aliphatic glue to the back two sides as shown below. 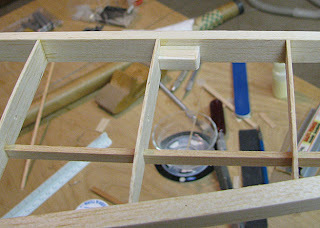 Once dry, the two sides joined at the back was removed from the jig. A spare hinge half was inserted between the two sides to maintain the gap and a piece of 1/16" balsa was glued to one end of the sides and allowed to dry as shown below. 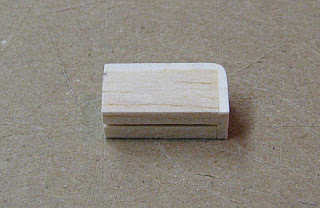 The sides of the enclosure were trimmed and sanded smooth and the other end was sanded off square. 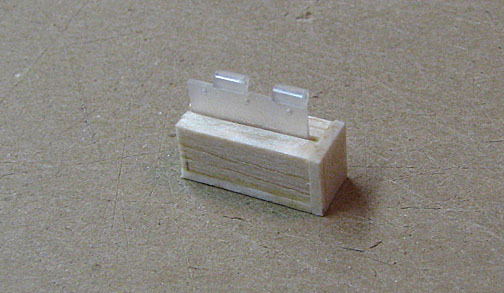 The enclosure was finished by sanding a small radius on the one closed corner as shown below. This picture shows one of the hinge half tongues extended out beyond the inside face of the stab rear spar. 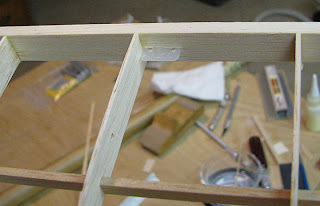 Aliphatic glue was applied to the edges of the enclosure, which was then carefully slid over the hinge tongue and into place against the rear spar and stab rib as shown below. 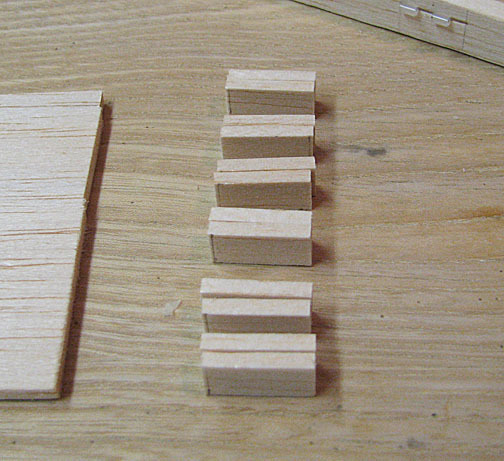 This was pretty labor intense considering that this process had to be repeated twelve times for the twelve hinge halves. However, all twelve enclosures were built and glued in place by working the entire day as the picture of the horizontal tail below shows.